Three brand new vermouths have been brought to the United States, but these are not “new” – dating back to 1884. The name for these new/old products is Maurin. The traditional vermouth recipes of the Maurin Distillery have been revived for a new line of Maurin Vermouth. These recipies, dating back to the late 1800’s and the start of the Maurin brand, are complex formulas that incorporate a blend of wines from various regions, and infusions of provincial spices and flavors such as coriander, cinnamon, gentian, cloves, nutmeg, dry oranges, caramel, absinthe, green cardamom and lemon. Maurin Dry-Sec – Freshly cut French herbs, thyme, tarragon and rosemary are in the forefront along with salt covered stones and aromatic spices like saffron. Maurin Red-Rouge – Sweet Spices like nutmeg and cardamom give way to sea salt-slicked volcanic stones and burts of ginger and crushed cloves.15 natural botanicals combine to make this vermouth sing! Maurin White-Blanc – This vermouth is soft with a finish that goes on and on.Sweet and tart, this white vermouth behaves in a cocktail and fits perfectly in a negroni! 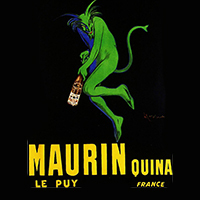 Maurin Quina is a sweet white wine fortified with an infusion of wild cherries, quinine and measured amounts of cherry brandy, lemon and cherry juice added. It is versatile, elegant and subtle, an aperitif that is lovely on its own, and is perfect as a mixer. Maurin Quina has a delicate red hue, and bright cherry flavor with a quinine backbone. The subtle wine base elevates an array of wild cherry, with light lemon and almond notes.